Our candles are made with soy wax, the top choice for those living healthy, natural lifestyles. Soy wax candles are made from soybean oil, while paraffin candles are made using petroleum. Soy wax candles don't increase carbon dioxide levels in your house-or in the atmosphere. 2. Burn the wick for at least 2 hours when first used to avoid candle tunneling. 3. Do not place the burning candle on an unstable surface. 4. Burn no longer than two hours each time. 6. Trim wick to 1/4'' prior to lighting. Do not allow wick trimmings to accumulate in wax pool. 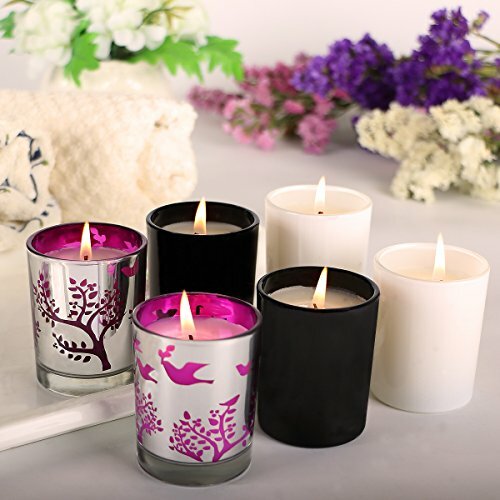 Natural Ingredients: Scented candles are made with 100% soy wax eco-friendly, All ingredients of scented candles meet natural standards and a cotton wick produce no black smoke when lit up. 6 Special Scents: Soy Candles with Gardenia, Lemongrass, Pine, Vanilla, Lavender, Peppermint - 6 special scents choice for every day or your rooms. Clean Burning & Last long: Our candles sets are 2.5oz per each, 15 - 20 hours burning time. Ideal Gift Set: This scented candles makes a perfect gift for friends, families in birthdays, Christmas, anniversaries, Mother's & Father's Days, or other holidays. Fresh Fragrance: Light the glass candles to set the ambiance in the bedroom, to relax when bathing, or to establish the right mood at a party or celebration. Try and share your experiences now! If you have any questions about this product by Humbgo, contact us by completing and submitting the form below. If you are looking for a specif part number, please include it with your message.